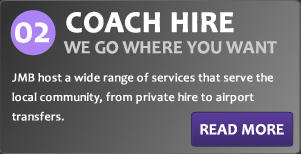 Coach Hire, Bus Hire and Minibus Hire. Welcome to the JMB Coaches website, a company like so many in Northern Ireland that not only offer a quality service but do so with a smile on their face and a willingness to go that extra mile (excuse the pun!). We are thrilled that you are visiting our website and look forward to hearing from you soon. JMB Coaches is a premium coach hire company located in the centre of Northern Ireland outside the market town of Cookstown.